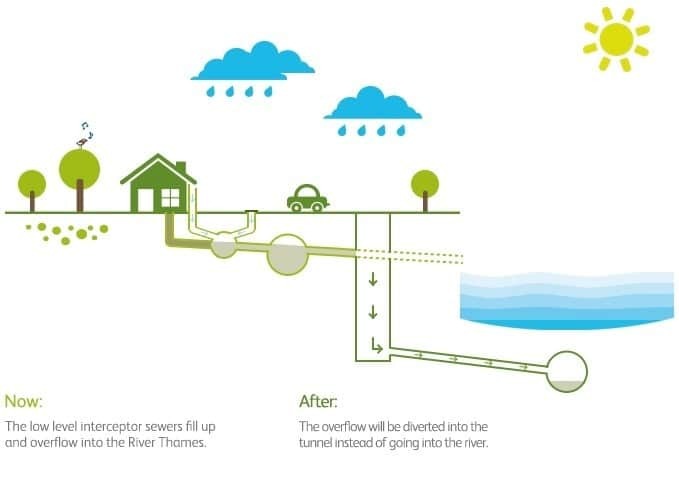 The Thames Tideway Tunnel (aka ‘super sewer’) is London’s proposed solution to the sewage overflows into the River Thames. It will be a 7.2m diameter, 25km-long tunnel, up to 65m below ground. The tunnel will create potentially the biggest sewer network in Europe. However, not everyone is happy about the ‘super sewer’. Environmentalists say it could cause significant disruption over a decade, and that cheaper, green alternatives should be considered, including “living” walls and roofs to drain rainwater back into soil and not into the sewers. Currently in Central London, we have a combined sewer system – storm water runoff and waste water enter the same sewers. This is fine until it rains; heavy rain sees the sewers filling up quickly, and the dirty water needs somewhere to go. Instead of flooding out streets and bathrooms, the sewers are designed to flow over into the Thames. There are 57 combined sewer overflow sites on the Thames. In the 19th century when engineers first designed the sewers, these were only overflowing around 12 times a year. Now this happens about 60 times. The combined sewers are polluting the Thames, and London is in breach of the EU Urban Waste Water Directive. How will the super sewer work? The Tideway Tunnel will work by intercepting sewage from 34 of the current combined sewers before it overflows into the Thames. The combined sewer system discharge points will connect to the tunnel under the Thames. The dirty water will now be stored in the super sewer before being pumped in to the Beckton Sewerage Treatment Works. Once the water has been treated, the clean water can be released to the river. It should take four years to build the tunnel, and the whole project should be completed by 2023. The Thames Tideway Tunnel is set to create more than 4000 jobs whilst the tunnel is being built, with serval thousand more jobs in the supply chain and the wider economy. At least 25% of employees will live in the boroughs where the work sites are located, with the wider economic benefit spreading across the UK.